The new LAPD headquarters building, opened in 2009 at First and Main streets in downtown Los Angeles, includes two outdoor memorial displays honoring the department's fallen officers. The first, at ground level near the main entrance, features several display cases with replicas of the officers' badges, along with their names and dates of death. 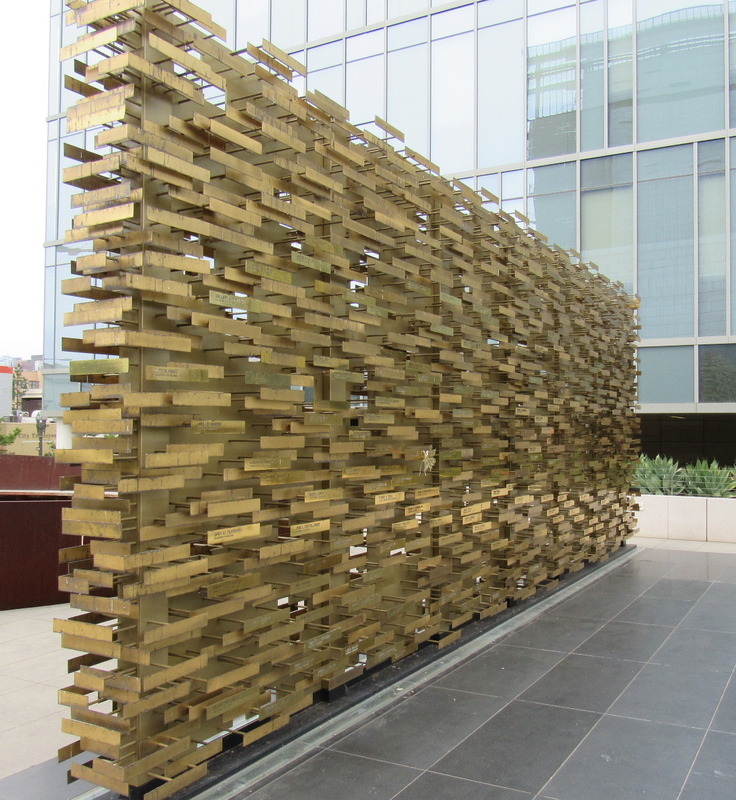 On an elevated plaza on the east side of the headquarters is the department’s Memorial to Fallen Officers -- a 32-foot-long, 12-foot-high wall made up of more than 2,000 brass plates. More than 200 of these plates are etched with the names, ranks and dates of death of LAPD officers who died in the line of duty. The polished brass plates, seemingly suspended in air in front of the wall, are a reference to the officers' badges. Directly across the street from the memorial wall, at the corner of Second and Main streets, is the location where one of those officers was shot and killed. On Wednesday, Aug. 20, 1924, Officer Edward Everett Wilhoit was walking his beat near the corner, with Det. Lt. Chester A. Lloyd. The officers were talking with a man who had lost money in a con game being operated in the area when a storekeeper came out to the street and told Wilhoit and Lloyd that a young man had been in his store, and was carrying a handgun. The storekeeper pointed out the young man on the street, and Wilhoit approached him. Wilhoit placed his hand on the young man's shoulder, and told him that he was going to take the gun away from him, witnesses said. The young man pulled away from Wilhoit, turned and shot the officer four times, and continued shooting until his gun was empty. Wilhoit did not have a chance to draw his gun. Three bystanders were also hit by bullets -- Lee N. Flick, 36, hit in the leg; Rose Cort, 41, hit in the leg; and William Muir, 79, hit in the ankle -- but all were minor injuries and all three survived. Wilhoit was taken to the Georgia Street Receiving Hospital, with gunshot wounds in his chest, his right side, and both legs, but was able to give a detailed description of the shooting. The shooter ran east down Second Street toward Los Angeles Street. Lloyd and five other officers in the area who heard the shots and saw the man running and waving his gun in the air chased him as he ran into the Rescue Mission on Los Angeles Street. One of the pursuing officers fired two shots at the man, but missed. The officers chased the man to the second floor of the Rescue Mission, where they found him barricaded behind overturned furniture. The man pointed his gun at the officers and pulled the trigger, but the gun was empty. Lloyd and Motorcycle Officer Ed German wrestled the gun away from the man, took him into custody, and brought him to the Receiving Hospital, where Wilhoit was able to positively identify him before he died. Wilhoit was 35 years old. Wilhoit was born on Nov. 18, 1888, in the tiny town of Monterey, in northern Kentucky, the fifth of seven children born to Francis and Mattie Wilhoit. (His younger brother, Ralston, died in infancy in 1892.) Wilhoit moved to Southern California and worked at a series of jobs before he joined the police department on Oct. 10, 1917, when he was 28 years old. Wilhoit was buried with full police honors at Inglewood Park Cemetery. More than 50 LAPD officers, including Chief R. Lee Heath, who had been on the job for only a few weeks, and Lt. Louis L. McClary, head of Wilhoit's division, led the funeral procession from the mortuary to the cemetery. After Wilhoit's killer was taken into custody, police found a watch in his possession that had been reported stolen 10 days before. During questioning, the young man admitted shooting Wilhoit, and also confessed to several recent burglaries in the area. He said that when Wilhoit put his hand on his shoulder, he took the gun out of his pocket and initially intended to give it to the officer, but "then I got nervous and fired." Although the man had documents, including his driver’s license and passport, that listed his age as 22, he told police he was only 16. Wilhoit's killer was charged with first-degree murder. During his trial, he claimed that Wilhoit approached him and struck him on the head, and he didn't remember anything after that. After about a week of testimony and just before the case was to go to the jury, one of the jurors died. Before a new trial could be scheduled, Wilhoit's killer changed his plea to guilty, and was sentenced to life in prison. Wilhoit's killer arrived at San Quentin State Prison on Nov. 1, 1924, to begin serving his sentence. He died of tuberculosis in prison on March 1, 1935. Wilhoit's sign is located on the southwest corner of South Main and West Second streets, across the street from LAPD Headquarters.